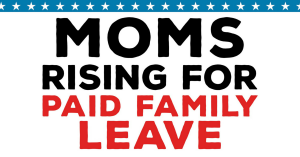 Tell CO lawmakers: We need paid family leave for ALL working families! Paid family and medical leave combats poverty, gives children a healthy start, and lowers the wage gap between women and men by providing structural support to balance work and family. Right now only 17% (!) of Americans have access to paid family leave through their employer and fewer than 40% have personal medical leave provided through an employer. Although the current Family Medical Leave Act (FMLA) allows some employees to take up to 12 weeks of job-protected leave, it only covers about 60 percent of employees. A quarter of all poverty spells in the United States are because of having a baby. The U.S is one of the only countries in the world that doesn't offer paid leave to new mothers. Paid family leave has been shown to reduce infant mortality by as much as 20% (and the U.S. ranks a low 37th of all countries in infant mortality). Paid leave improves worker retention, which saves employers money through reduced turnover cost. To mark Equal Pay Day and spread awareness about the punitive gender wage gap and possible solutions, like paid family and medical leave, MomsRising and Main Street Alliance created custom coffee sleeves and napkins for coffee shops across the nation to use on April 2nd. Can you believe that in the United States only 15% of workers have access to paid family and medical leave? 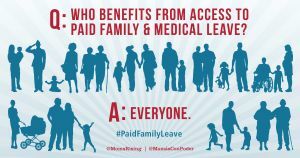 Add your name to our letter urging every member of Congress to co-sponsor and support the FAMILY Act - the paid family and medical leave insurance act that will soon be reintroduced in Congress. 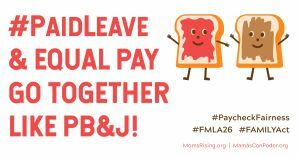 You already know #PaidLeave is our jam. Tell the U.S. Senate: Support the FAMILY Act, not fake solutions! Working people in the United States need a national comprehensive and robust paid family and medical leave program that is more than just maternity and paternity leave and that does not threaten retirement income. Tell the U.S. Senate: Support the FAMILY Act, not fake solutions. The Oregon legislature adjourned the 2018 legislative session without taking action to pass paid family and medical leave. Contact your state lawmakers and urge them to make paid leave a top priority in the 2019 session. 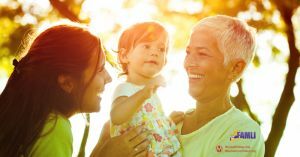 Learn more about Paid Family and Medical Leave and take action to be sure all Washingtonians benefit!